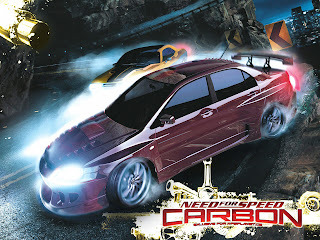 Need for Speed: Carbon, also known as NFS Carbon or NFSC, is an Electronic Arts video game belonging to the Need for Speed series. Released in 2006, it is the tenth installment, preceded by Need for Speed: Most Wanted, succeeded by Need for Speed: ProStreet in release order and succeeded by Need for Speed: Undercover in chronological order. This was the first game to gain the PEGI Rating of 12+. The game is a sequel to 2005's Need for Speed: Most Wanted. The locations of both Most Wanted and Carbon (Rockport and Palmont, respectively) are featured in the 2010 MMO game, Need for Speed: World.